Robinson College provides a very high standard of accommodation and is justifiably proud of its 4 star Campus VisitEngland rating. Accommodation is supplied in Standard Plus rooms. All rooms have their own bathroom with shower-over-bath and toilet. Many of these rooms are accessible by lifts and some have views over our beautiful gardens. Internet access is free of charge. All bedrooms have internet access via Wi-Fi or wired network point. Residents will need to provide their own laptop computer and Ethernet cable for connection to the wired network point. Ethernet cables can be purchased from the Porters Lodge. Smoking is not permitted in any of the bedrooms. 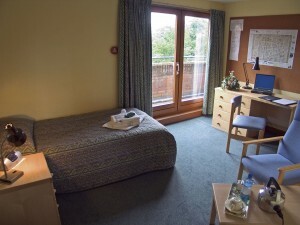 Some rooms are situated on almost the ground floor (up three steps) and many bedrooms and most other areas of the College are accessible by lifts. There are a limited number of rooms which are suitable for delegates with access needs. Please contact genes&cancer@in-conference.org.uk with any access enquiries you may have. The bedrooms are conveniently close to all facilities. Check-in is available from 13.00 and check-out on the day of departure should be by 09.30. Please note that failure to check-out by this time on the final meeting day may result in additional accommodation charges being applied. Accommodation rates (including breakfast) are inclusive within Full Residential Package rate quoted. If you are registering after the 27th February, the residential package is no longer available. It is possible to book the non residential rate and if you require accommodation, please book via this link. The rates are subject to availability.